For Ronnetta Dillard, a Liberal Arts 2016 graduate, receiving her degree was not the only thing she accomplished at Manor College. 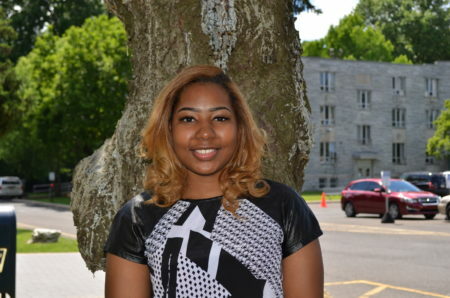 She consistently took the extra step needed to succeed which left her with a strong skillset to pursue her Bachelor’s degree from Alvernia University, while earning the Opportunity Scholarship provided by GlaxoSmithKline. The scholarship, worth $5,000, honors those students who will thrive in their field, and who have overcome adversity in their life. With the education she received from Manor College, Ronnetta Dillard is bound for a bright future in the field of healthcare administration. Why did you choose to attend Manor College? I chose Manor because I was referred by a close friend who was also a student during the time. She went to Manor straight out of high school, while I waited a year so she was able to give me an idea of her experience at Manor. I told her that I was looking for a small sized campus where I could easily adjust, stay focused and get the attention/help I need. What was your favorite part of Manor College? My favorite part of Manor was being able to get the highest amount of information and assistance about College in general from each and every staff I encountered with about; credits, financial aid, student portal, registration, etc. Not only was this a great advantage because very few student have knowledge of these things prior to arriving, and/or as a freshmen, but also I loved the fact that it was also very easy to connect with a tutor, as well as the facility who assists students when working in the library. I also enjoyed the campus cookouts before the summer break were student had the opportunity to relax, eat, listen to music and dance! How has Manor College gotten you to where you are today? Manor College has gotten me to where I am today because I know now how to manage my college life fairly independently, and also help other college students who haven’t received the same amount of help I did from Manor. The biggest impact on me at Manor College was my advisor and professor, Mike Landis, who guided me to figure out the best options within my field of interests. He also helped me find the most cost efficient, and strategic way of picking classes so that I could not only get a head start when continuing at a University, but also avoid taking unnecessary courses. He made it a little less stressful to manage my courses, and pushed me to be able to finish my last semester with a total of 6 classes at once. He also encouraged me to become the proud Phi-Theta-Kappa member that I am today. Mike Landis also supported me through numerous amounts of scholarship applications through letter of recommendations, which was also a huge reason why I currently received the GSK scholarship. Mr. Landis was not only a big support throughout my college career both inside and outside of Manor, but was also almost always available despite his busy schedule, as well as always had the right resources to direct me to when something was outside of his field of expertise. Who was your favorite professor while at Manor? My favorite professor at Manor was Professor Marc Minnick. He went above and beyond to make sure his students understood the material both inside and out of the classroom. He was the professor in my Financial Accounting class and his calm presence made the normally hard subject a lot easier. Professor Minnick also wrote recommendation letters for me which was greatly appreciated. Do you have any advice for current students at Manor? The advice I would give to current students at Manor would be to utilize all resources that are offered at the school. Since Manor is considerably small sized, each department is very easy to communicate with, as well as very professional. Considering that I had the experience to compare a large sized college, after completing just one semester, I had not only realized the advantages of small classroom settings, but also the advantage I had at Manor College as a whole. I would also say that utilizing the lounging area, library, and the learning center, between classes, as a studying area, setting to complete homework, or to just relax can also be very helpful, especially for full times students. What does being awarded the GlaxoSmithKline Opportunity Scholarship mean to you? Being awarded the GSK Opportunity scholarship means a lot to me and is truly a blessing. It gives me a sense of relief that hard work in fact pays off, as well as motivation to continue to work hard. Within the next year, a short term goal that I am currently working on, is to continue to exceed academically and gain as much hands-on experience as possible through internship and/or community service. I plan to accelerate in my career to the highest capability, and potentially complement my bachelors degree with a Master’s in public health.